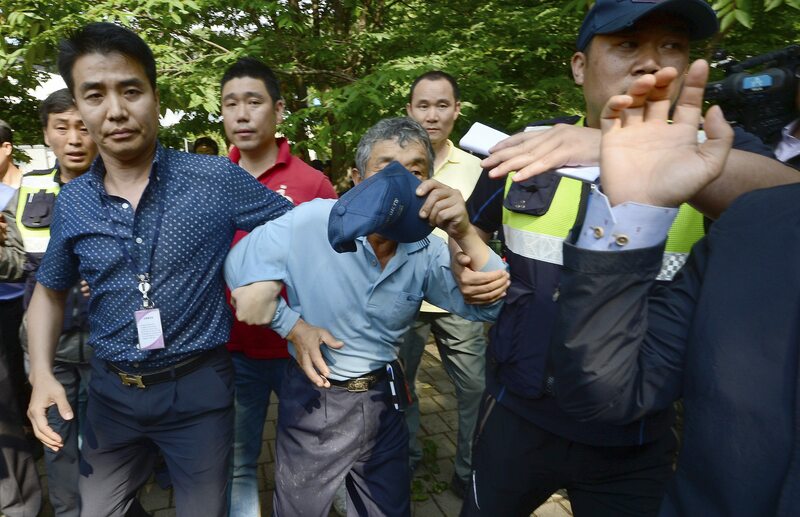 SEOUL, South Korea -- Thousands of South Korean police officers stormed a sprawling church compound Wednesday in their hunt for a fugitive billionaire businessman over April's ferry sinking that left more than 300 people dead or missing, officials said. Authorities believe the businessman, Yoo Byung-eun, owns the ship and that his alleged corruption may have contributed to the sinking. Police and prosecutors have been after Yoo for weeks and are offering a $500,000 reward for tips about him. Yoo, 73, is a member of a group called the Evangelical Baptist Church, which critics say is a cult. About 5,000 police officers, some wearing helmets and armed with plastic shields, raided the group's compound in Anseong, just south of Seoul, officers said on condition of anonymity, citing department policy. Four church members were detained for allegedly providing shelter to Yoo or helping him flee, police said. Another church member was detained for allegedly trying to obstruct the raid. It was not clear whether Yoo was at the compound at the time of the raid. Police said they were still trying to find and detain more church members for allegedly aiding Yoo. The compound, the size of about 30 soccer fields, is considered the church's headquarters and thousands of church members gather there for services on weekends. The area contains ranches, fields, a fish farm and an auditorium that can house up to 5,000 people, according to media reports. About 200 church members rallied against the raid, singing hymns, pumping their fists into the air and chanting slogans. A large banner hanging near them said, "We'll protect Yoo Byung-eun even if 100,000 church members are all arrested." There were no reports of violence. Yoo, head of the now-defunct predecessor of the ferry's current operator, Chonghaejin, allegedly still controls the company through a complex web of holding companies in which his children and close associates are large shareholders. The government has offered a $100,000 bounty for Yoo's eldest son, and one of his daughters was arrested in France late last month. Yoo's church made headlines in 1987 when 32 people, who critics suspect were church members, were found dead in the attic of a factory near Seoul in what authorities said was a collective murder-suicide pact. The church has denied involvement. Negative public views of the church grew following the 1987 deaths but church members have since focused on legitimate corporate activities, according to Tark Ji-il, a professor of religion at Busan Presbyterian University. He said the church's membership is believed to be about 10,000. The sinking, one of South Korea's deadliest disasters in decades, has caused an outpouring of national grief, and the country is undergoing national soul searching about public safety. Nearly two months after the sinking, 292 bodies have been recovered - mostly students from a high school near Seoul - and 12 people are still missing.